Artist Scott Burroughs almost misses the his plane. From Martha’s vineyard, a wealthy media mogul and his family are flying a private jet to New York. The wife of the powerful family patriarch had befriended Scott not too long prior and had invited him to take the trip with them as long as they were heading to New York anyway. But only a bout fifteen minutes later, the plane crashes into the rolling ocean. Scott sees only the four-year-old child of the family still alive and struggling against the sea. He latches onto the boy and pulls him underwater to avoid the crashes of a wave, and then swims and pulls the boy in the direction he hopes is the shore. It’s not an easy swim and Scott likely would have given up if he hadn’t now been responsible for the boy as well. But the drowning death of his sister many years ago, and his subsequent swimming lessons have him determined to keep swimming. But surviving the sea is only the first step in the aftermath of the plane crash. Scott will face a barrage of questions and insinuations as to what exactly happened. Being a struggling artist with only the remotest of connections to the family, what was he doing on that plane? Was he having an affair with the wealthy matriarch? And now, as he avoids the press and their questions and connects with the remaining family of the boy (who is set to inherit millions), is he trying to insert himself in the boy’s life in order to capitalize on those millions? Author Noah Hawley has given us a truly remarkable, though sad, commentary on our modern society. Every act of courage, every act of kindness, will be scrutinized and questioned by someone who is more interested in finding dirt and building ratings As a reading audience, we can’t help but sympathize with Burroughs, who shows us the remarkable things a human can do when pushed and when a very life is on the line. And because we connect with him in this way, it gets us angry when he is facing unnecessary (or so we perceive) negative publicity. But Hawley does let us wonder, just a bit, if there isn’t something about Burroughs that we don’t know – something that might suggest he’s not quite what he claims to be. And this is what drives us in the story. The beginning and the ending here were quite strong, but the story sagged in the middle. We really weren’t given enough new information or new story to keep us motivated and guessing through the middle of the book and it’s this that keeps it from being a truly outstanding novel. It is worth reading however. Looking for a good book? 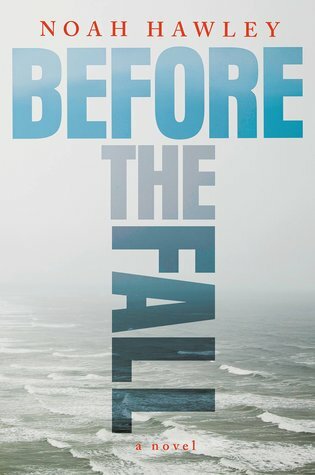 Before the Fall by Noah Hawley is a thrilling work of modern literature that captures the best and worst of humanity today. I receive a digital copy of this book from the publisher, through Netgalley, in exchange for an honest review.